Every time the Alliance retakes control of Darkshore, they have an opportunity to claim Toys from fallen rares. This can only be done once per cycle however, so here in this article, you will find the location of each rare that drops a unique Toy. We are also providing you with a helpful route for you to take for a quick and easy farming session. 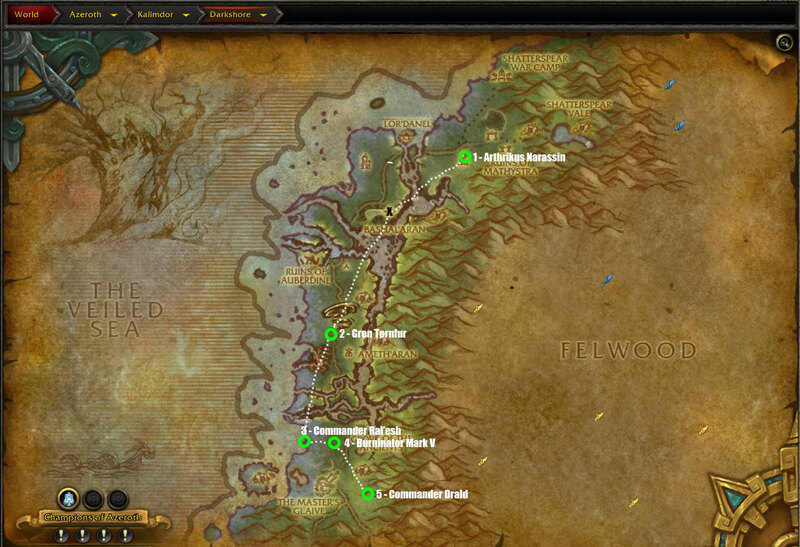 For our Horde readers, you can find the location of your Toy dropping Rares over here. This horrific spirit has a a terrifying scream that can send everyone running. Be quick to interrupt her fear, as she casts it rather quickly. Upon defeating her, she might drop you a Narassin’s Soul Gem, which can be used to trap the souls of dead targets. This furbolg shaman, likes to create massive AoE effects that you need to avoid. By defeating him, you can get a Detoxified Blight Grenade, which covers a target in an inert version of the Forsaken Blight. This armored Naga brute, has a chance of dropping a Twiddle Twirler: Sentinel’s Glaive. Essentially, it’s a fidget spinner. Destroying this contraption forces its Goblin pilot to jump out. Killing him gives you a chance to get yourself a Twiddle Twirler: Shredder Blade, which is yet another fidget spinner. Defeating this Wolf riding Orc, gives you the chance of getting a Highborne Memento, which gives you access to a Highborne Spirit costume.